The European Statistical Agency Eurostat released today its “flash” estimate of GDP growth in the European economies in the fourth quarter of 2012. The results are terrible. The initial estimate is that GDP fell at a seasonally adjusted annualized rate of 2.4% in the fourth quarter (or a fall of 0.6% quarter on quarter) in the 17 economies that make up the Eurozone, and that GDP fell at an annualized rate of 2.0% (0.5% quarter on quarter) in the 27 economies in the European Union as a whole. The 2.4% rate of fall of GDP in the Eurozone, and fall of 2.0% in the EU as a whole, can be contrasted with the recently released estimate that GDP in the US was essentially flat (a 0.1% rate of decline in the initial estimate) in the fourth quarter of 2012. The flat GDP in the US at the end of 2012 was not a good performance, and has been justly criticized as well below what is needed. But the fall at a rate of 2.4% in the Eurozone was far worse. As shown in the graph above, Eurozone GDP has now fallen steadily for five quarters in a row. Europe is well into a double-dip recession, having never fully recovered from the 2008 downturn, and its GDP is now 3% below what it was in the first quarter of 2008, almost five years ago. Not only is output falling in Europe as a whole, but it is also falling in each of the major countries. Especially notable is the fall in GDP at an annualized rate of 2.4% in Germany. GDP in Germany had been rising at a modest rate since mid-2009, although the recovery slowed in 2011 and has now turned negative. But in addition to Germany, there were falls in GDP at annualized rates of 1.2% in France and the UK, of 0.8% in the Netherlands, and also of 2.8% in Spain and 3.6% in Italy (not shown in the graph above). UK output is now even further below the path it followed during the Great Depression in the 1930’s. As discussed in an earlier posting on this blog, the UK economy is performing worse now than it did during the Great Depression. The turnaround from what had been a modest but steady recovery occurred in mid-2010, when the newly elected Conservative-led government embarked on an austerity plan similar to what Republicans have called for the US to follow. But the consequences have been terrible. By 19 quarters into the downturn (one quarter shy of five years), the UK economy is producing 3% less than it had in early 2008. At the same point during the Great Depression, the UK economy was producing 4% more than at its previous cyclical peak, and growth was steadily positive. The fall in German GDP is significant, as it may now induce Germany to agree to steps that would allow Europe as a whole to recover and start to grow. Germany has been a forceful advocate for austerity in both fiscal and monetary programs, even though (as discussed in an earlier posting on this blog), Germany itself had until 2011 had its government expenditures grow relatively strongly. But its economy slowed in late 2011 and into 2012, and output has now fallen sharply in the last quarter of 2012. Germany has strongly resisted measures which would have served to boost European growth, but there may now be a basis for the hope that this will change, now that Germany sees its interests aligned with those of others in Europe. Reverse the austerity policies, at least among the economies with ready access to the financial markets. Ten year government borrowing rates are only 1.5% in Germany, 1.7% in the Netherlands, 1.8% in the UK, and 2.2% in France. These are either below, or close to, the 2% inflation target of the ECB and others. That is, these governments can borrow ten year funds at essentially zero or even negative real cost. It is madness not to make use of such funds to pay for investments in infrastructure, education, and other purposes, at a time when resources (both labor and capital) are idle due to lack of demand. Indeed, it is in times like these when such public investments are best made. Not only do they boost the recovery, but they do not displace the use of such resources for other purposes. When the economy is close to full employment, with capital also being fully utilized, using resources for infrastructure and other public investments entails a trade-off, as the resources then used for such public investment have to be drawn from their use for other purposes. The trade-off might then still be warranted, but it is far better to make such public investments in times like today, when there is no such trade-off. The European Central Bank should follow the more supportive monetary policies that have been followed by all the other major central banks in the world, including in the US, the UK, and Japan. The main policy interest rates at all these other central banks have been kept at 25 basis points (0.25%) or below since their economies started crashing in late 2008. The European Central Bank, in contrast, kept its main policy interest rate at 100 basis points from May 2009 to April 2011. This relatively high rate at a time of economic weakness led to greater economic weakness, as shown in the graph above. It then made the mistake of starting to raise the rate, first to 125bp and then to 150bp in the spring and summer of 2011. 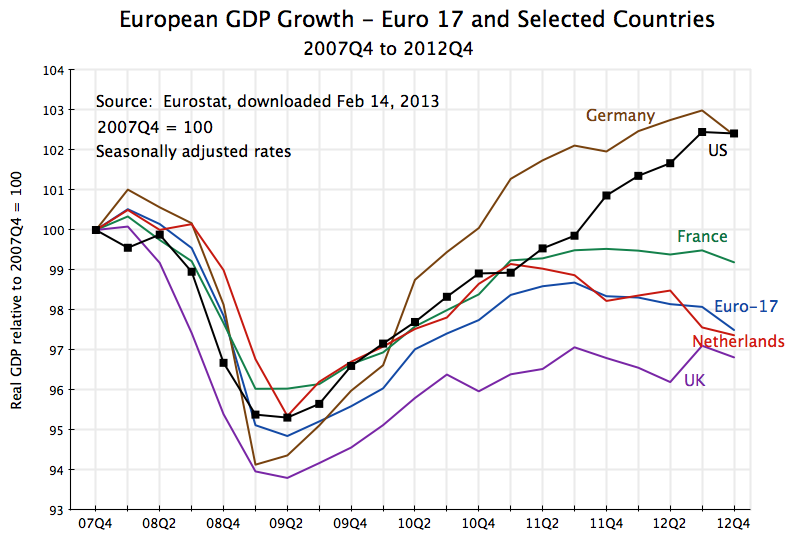 The renewed downturn in GDP of the Euro 17 started soon thereafter (see the graph above). The ECB then started to lower the rate again in late 2011, but it was too little and too late. And the policy rate remains (since mid-2012) at 75bp, well above the rates followed by the other major central banks of the world. The ECB should lower its rate to 25bp immediately. Weakness in the commercial banking system in Europe remains a major problem, particularly as financial markets in Europe are far more dependent on their commercial banking systems than is the case in the US (where capital markets are relatively larger). When the euro was under intense pressure last summer, European leaders agreed to move to some form of a system of more centralized commercial bank regulation and supervision. But while an important agreement was reached in December 2012, under which the European Central Bank would supervise directly the larger banks in Europe, this agreement did not go as far as had been earlier anticipated. While it was agreed that the ECB would have direct responsibility for the supervision of the major banks, its authority to deal with failing banks and the resources it could use to do so, were kept limited. There is also no central system of deposit insurance, but rather still a set of different systems at the national level. A euro-wide system of bank regulation and supervision, with the power and resources to address failing banks and with a consolidated deposit insurance system, would go far to addressing the weaknesses of a common currency zone. In a common currency zone, the ability of national authorities to deal with failing banks is constrained. Europe is now in a double-dip recession. The austerity programs have failed. Yet Republicans in the US continue to push for the US to follow similar policies. This entry was posted in The Economic Crisis and tagged austerity, economic crisis, economic growth, Eurozone, GDP by aneconomicsense. Bookmark the permalink.